One of the things that Put-in-Bay is most famous for is golf carts. This unusual preferred mode of transportation is memorable for all guests of the island. 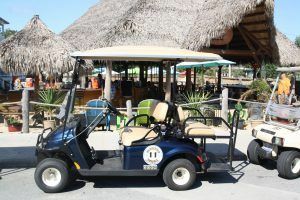 The biggest reason the golf carts gained popularity is that parking is scarce on the island, especially on the weekends, and the carts take up less space. A happy accident, then, that everybody absolutely loves driving their golf carts around the Bay! It has become an essential part of the Put-in-Bay experience. to the newest golf carts on the island courtesy of Island Club Golf Cart Rentals. These 4- and 6-person carts are exclusively available to Island Club and Put-in-Bay Condo guests. They have the best rates on the island for the newest carts. You can contact Island Club Golf Cart Rentals by phone at 216-898-9951 from 9am-6pm daily. You can also visit their website to book if you prefer. If you do NOT have a reservation with the Island Club or Put-in-Bay Condos, the Put-in-Bay Golf Cart Depot is the preferred golf cart rental company on the island. 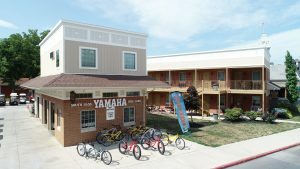 Put-in-Bay Golf Cart Depot provides golf carts and bicycles to island visitors all summer long. They are located right by downtown Put-in-Bay next to the Put-in-Bay Brewery and Distillery and the Put-in-Bay Police Department. Choose from two, four and six passenger golf carts for rent. Customers can opt for hourly, d aily, overnight, or weekly. The two person cart is electric powered, the four and six person carts are gas powered and a high quality Club Cart. If necessary, fill up the cart at Put-in-Bay Gas Station, but they rarely run out of gas.